Galia (MIREILLE DARC), vivacious and beautiful, is the quintessence of the contemporary, independent young woman. In her early twenties, she has fled the provincialism of her small hometown, Etretat, for the sophistication of Paris, where she has become a successful window decorator, living in a penthouse apartment on the Left Bank. She chooses lovers with an unencumbered spirit, insists her affairs be brief ones, and is guided solely by the principle of pleasure. She is proud of her freedom and will not become deeply involved in a relationship, although she does admit to periods of depression and to the desire for a grand adventure. Her desire for adventure becomes a reality one night when she rescues a woman from drowning in the Seine. Galia takes the woman, Nicole (FRANCOISE PREVOST), who is a few years older than herself, to her apartment. 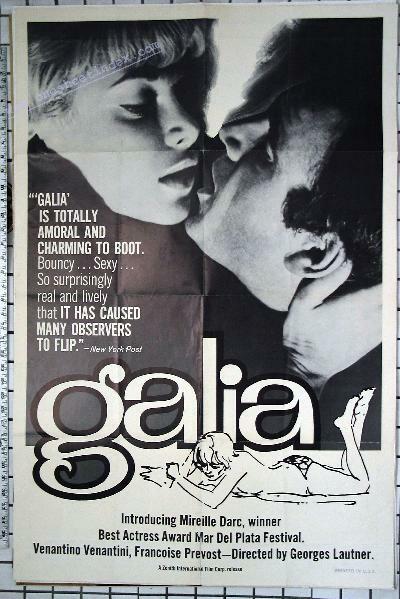 There, Galia learns that Nicole has attempted suicide because of an unhappy marriage to an unprincipled and unfaithful husband, Greg (VENANTINO VENANTINI). she left for her husband at their apartment. Galia finds.the note, but decides to leave it for the husband, convinced that some suffering and guilt would be a just punishment for such a man. Nicole next asks Galia to spy on her husband, which eventually leads to a meeting between the young woman and Greg, who never mentions his wife. Greg finally induces Galia to spend a weekend with him in Venice. The affair is a completely new experience for the girl, who, in spite of her awareness that Greg is a rake and opportunist, falls hopelessly in love with him. Nicole, however, remains at Galiats apartment, repeatedly but unsuccessfully Warning Calia against the romance. One day, Greg admits to Galia that his wife has killed herself and asks her to meet him at the morgue, where he has gone to identify the body. He shows her Nicole's suicide note, explaining that he had often asked his wife for a divorce, but that she would not grant him one. He asks Galia to marry himas soon as he can straighten out his affairs, which include the matter of an inheritance, for the money which has paid for their apartment and his business was Nicolets. Galia begins to fear she has been caught in a dreadful and dangerous game being played between the corrupt Greg, whom she loves, and the strange Nicole, whom she cannot understand. Her fear becomes torment when, one morning, she sees the two deep in conversation in a park. She goes to Greg's apartment and confronts him with the meeting with Nicole. He admits to having known his wife was alive, living with Galia, and insists that he met her to continue his plea for a divorce. Even though he tells the girl he plans to kill his wife, who is legally dead, to obtain her money and his freedom, she cannot overcome her passion for him. Galia, lost and distraught, quickly returns to her apartment to find Nicole has left. Sensing disaster, she phones Greg. Nicole answers and calmly informs Galia that she has killed Greg so that he could not ruin Galia's life as he ruined hers.